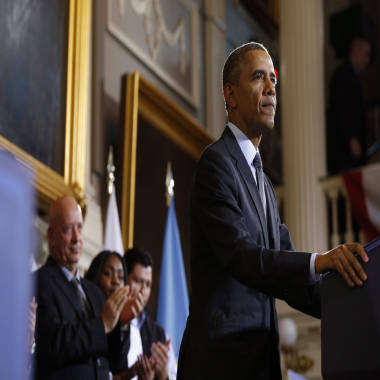 President Barack Obama speaks about health insurance at Faneuil Hall in Boston. Those events have combined to erase some of the advantage the president gained with polls showing most Americans blame congressional Republicans for the shutdown. And for the first time in the survey, even Obama’s personal ratings are upside-down, with 41 percent viewing him a favorable light and 45 percent viewing him negatively. “Personally and politically, the public’s assessment is two thumbs down,” says Democratic pollster Peter D. Hart, who conducted this survey with Republican pollster Bill McInturff. And half of respondents (50 percent) think it’s likely that there will be another government shutdown. Peter King explains why the president needs to stand with the NSA. GOP pollster McInturff says that if the previous NBC/WSJ poll -- conducted during the shutdown -- sent shock waves hitting the Republican Party, this new poll is sending shock waves hitting everyone else. “We’re mad as hell and we’re not going to take it anymore,” Hart paraphrases from that movie. And the American public is particularly mad -- at everyone -- after the government shutdown. By a 41 percent-to-21 percent margin, respondents say they have a less favorable impression of President Obama after the shutdown rather than a more favorable one. Ditto congressional Tea Party Republicans (45 percent to 12 percent) and congressional Republicans (53 percent to 9 percent). Still, more Americans blame congressional Republicans for the shutdown (38 percent) than Obama (23 percent), while 36 percent say they blame both sides equally. But the poll also shows that the political gains that Democrats made during the shutdown have eroded somewhat. Democrats have a four-point advantage among voters, 45 percent to 41 percent, on which party should control Congress after next year’s midterm elections. Yet that’s down from the eight-point edge, 47 percent to 39 percent, they held in the last NBC/WSJ poll. In addition, the health care law is slightly less popular than it was earlier this month, according to the poll. Thirty-seven percent see it as a good idea, versus 47 percent who see it as a bad idea. That’s down from the 38 percent good idea, 43 percent bad idea in the previous survey. But the public is divided over whether the problems associated with the health-care law’s federal website are a short-term issue than can be solved, or a long-term issue that signals deeper troubles. In the poll, 37 percent say that the website woes are a short-term technical problem that can be fixed, while 31 percent believe they point to a longer-term issue with the law’s design that can’t be corrected. Another 30 percent think it’s too soon to say. In a separate question, 40 percent say they are less confident about the health-care law from what they recently have seen, heard or read about it; 9 percent are more confident; and 50 percent say there has been no change. The NBC/WSJ poll was conducted Oct. 25-28 of 800 adults (including 240 cell phone-only respondents), and it has an overall margin of error of plus-minus 3.5 percentage points.